I love peanut butter cups. It is hard to find vegan ones and ones with a lot of peanut butter! So I decided to make my own! Seriously. Easy. Perfect. Place the liners on a baking sheet. Place a heaping teaspoon of chocolate into each cup and swirl it around so that it coats up the sides a bit. Place in the fridge for 5 minutes to set. While they are in the fridge, sift the powdered sugar into a bowl and drop in the peanut butter. Mix together using a hand mixer. Using a 1/4 teaspoon, place a little ball of peanut butter mixture in the center of the chocolate and sort of flatten it out a bit but not too much. Cover with the remaining chocolate until you can’t see any more peanut butter. Bang the tray on the counter a few times to even out the chocolate layer. Place back in the fridge for at least 30 minutes. You will know when they are done. 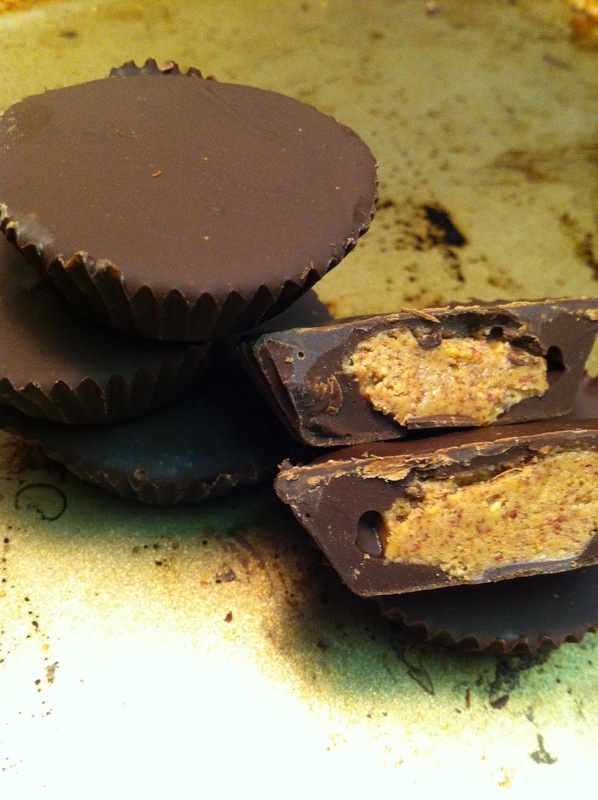 The perfect homemade chocolate peanut butter cup.